Rumis Lights 'em Up in his Top Sportsman Cobalt. Photo by: Bob Johnson Photography. 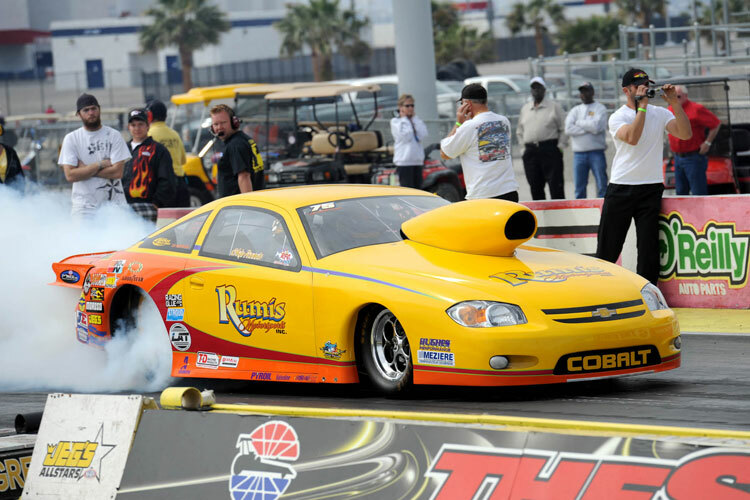 In only his second event of the 2011 season, Chip Rumis took both of his cars to the final round of their respective classes during the NHRA Pacific Division Lucas Oil Drag Racing Series held at The Strip at Las Vegas Motor Speedway. "It's a brand new 272 Spitzer car with Steve Schmidt 632 cubic inch power in it. 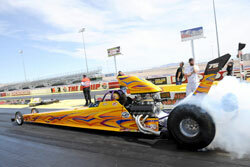 We just got it finished before the first race in Phoenix," Rumis said of his new Top Dragster. 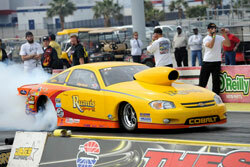 "My Top Sportsman car is an 2006 Jerry Bickel Cobalt and it also has the Schmidt 632 power as well." Chip Rumis' Beautiful New Spitzer Top Dragster. Photo by: Bob Johnson Photography. Although Rumis had a little carburation trouble out of the trailer, he landed himself as the number two qualifier in Top Dragster and qualified the Top Sportsman car nicely in the number six spot. 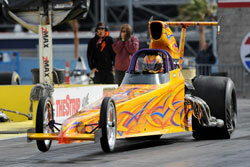 "I made it out of first round on Saturday night," he said of the Top Dragster. "And Sunday morning I had a bye in round two, which was a really critical round. The car was just working fantastic and I was cutting some great lights in it." Nice wheels up launch for Rumis as he works his way to his third Top Sportsman Final in as many events. Photo by: Bob Johnson Photography. Rumis was consistently doing his job on the starting line and is quick to point out that his good friend was a big help in dialing both cars. "My wife helps me and I had a young man with me and my neighbor was helping me with packing [chutes]," he said. "My racing partner, Joe Roubicek was helping me get onto the dial with both cars and things were just working real well. It was just one of those weekends where you start to get on a roll and you relax. You are not worried about the cars or the track. You can just focus on doing your job and it all gave me a nice payday." 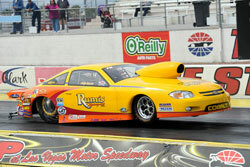 Rumis put his Top Dragster in a comfortable number 2 Qualified position at the Las Vegas NHRA Divisional. Photo by: Bob Johnson Photography. 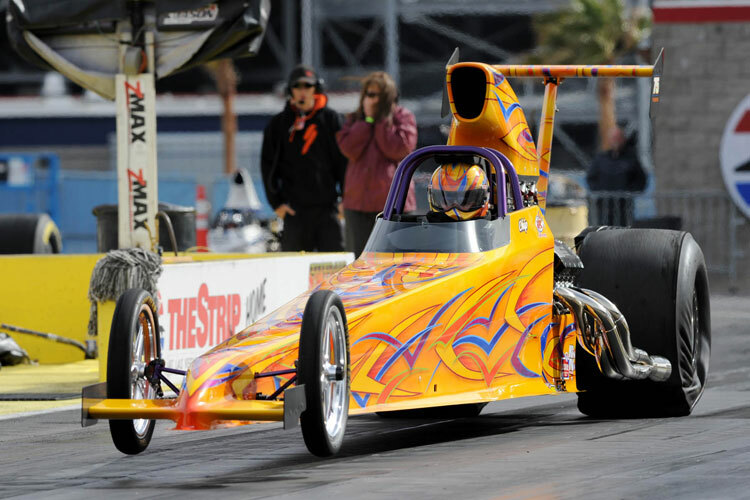 Although Rumis didn't have the starting line advantage in the Top Dragster final, he once again had a car that was dialed on the money and parlayed that into a 0.0112 margin of victory at the stripe running dead on his dial with an eight. All while he was going rounds in the dragster, Rumis was also making his way to the Top Sportsman final in his K&N Cobalt, where he has had some unfinished business as of late. "Over my last three races, I have been in three finals with the Top Sportsman car," he pointed out. 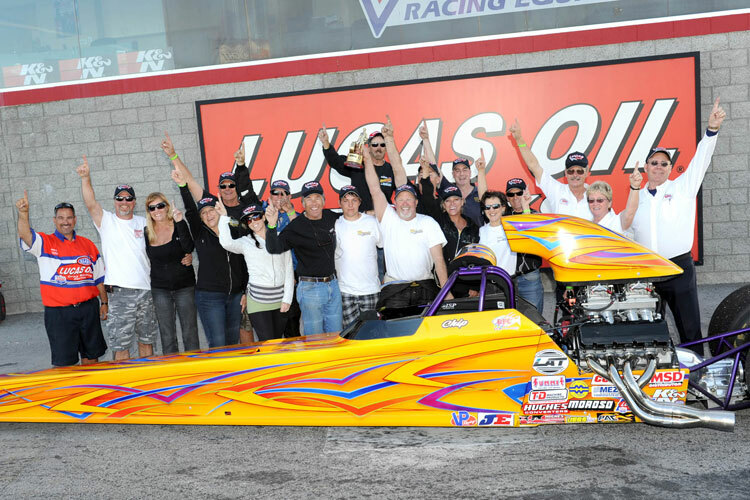 "Final race last year I runnered up to Kevin Klineweber and at the first race this season in Phoenix I runnered up again by going red by one thousandth of a second and then the Vegas race, well I just keep being the bridesmaid. I'm just not doing that poor car any justice. I just keep letting the car down in the final." 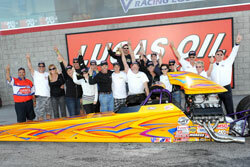 A super weekend for K&N's Chip Rumis with two final rounds and his first Top Dragster victory for 2011. Photo by: Bob Johnson Photography. "I had some really good races in the Top Sportsman car," he said of his rounds at Vegas. "The car got loose on me a couple of times. We had the wheelie bar a little too low on a couple of passes and it was driving me to the wall and we just didn't catch that quick enough. Driving both cars like that sometimes it's hard to catch the small things when you don't have a very big crew around you. But we got it straightened out." "In that final, the track picked up on me in my sixty foot," he continued. "I had thirty mile-per-hour on the guy and I had picked up one and a half [hundredths] and it was just really tough to scrub it off. After ten rounds of racing in two different cars, I just didn't want to make any bad mistakes and hurt myself or the car." Another thing that Rumis had to his advantage over the course of the weekend in both cars was that he was more so than not, the quicker car of the pair. This allowed Rumis not only to always watch his competitors leave and give them the first chance to red light, but also lane choice. "I was blessed because my cars were the fastest all the way through [the rounds]," he said. "That also gave me lane choice the whole weekend, which I chose to stay in the left lane all weekend. It really allows you to get into a rhythm, knowing what the car was going to do." "There are many racers out here that have been doing this for years and have never had a chance to hoist one of these [NHRA Wally] and I just feel very blessed every time it happens," he added. Rumis has been a K&N product user for many years and for the 2011 season, even his tow rig is getting the K&N treatment. "Of course the new Top Dragster has all the K&N filters on it as well as the Cobalt, plus we use all the K&N Racing Glue products," he noted. "We just installed a K&N air filter and oil filter on our motor coach." "All of us racers are very blessed to have guys like Steve Williams and Bobby Harris out there and around us," he added. "They are a great group of guys with some outstanding products and we use them all." 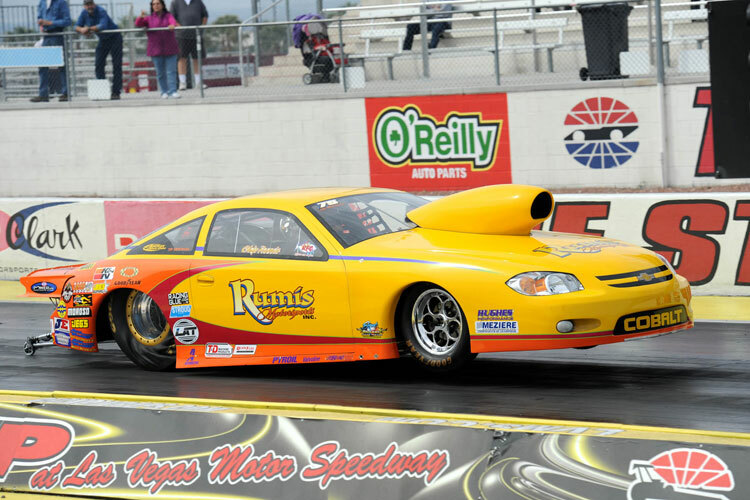 Rumis has a good jump start on his 2011 season, now sitting at number one in both Top Dragster and Top Sportsman NHRA Division 7 points and with only two events in the books some room to add to that lead.